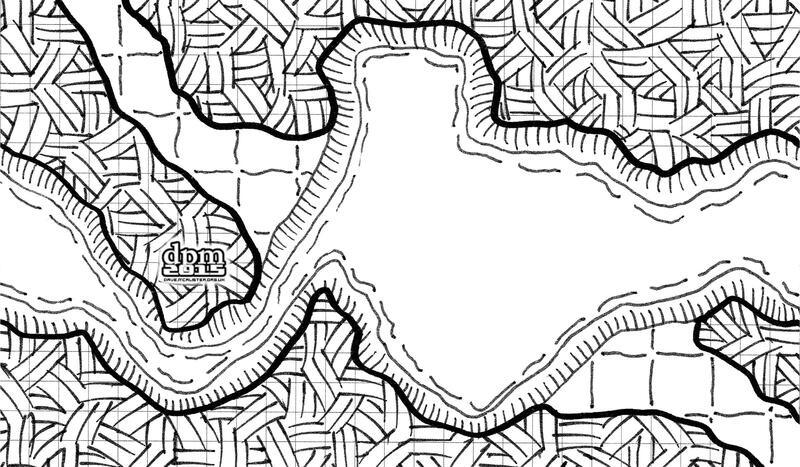 The latest in my Dungeon Project is another river section. This time it narrows (and deepens) as it approaches from the left. Due to the narrowness of the river there, it would be fair to suggest it is not only pretty deep (to accommodate the same amount of water) but also quite fast flowing as it enters the wider area. This fast flowing water could explain why there is no crossing available. Perhaps there was one once, but it was destroyed by the water and washed downstream (although which direction is “downstream” is up to you). I’d love to know if anyone is using these maps in their games and, if so, how it goes.